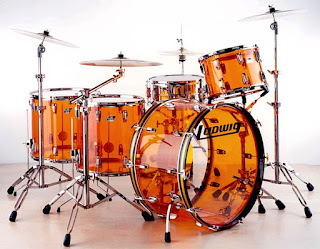 In a previous post, Our love affair with wood shells, I asked, "Why aren't more drummers opting for the consistent tone, durability, and reduced sensitivity to heat and humidity that synthetic drums offer?" 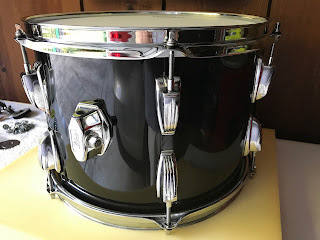 As my regular readers know, I love my Rocket Shells 8x13 snare drum with its carbon fiber shell, but I have never played drums with acrylic shells, such as Ludwig's legendary Vistalite line. That is about to change--last week, I purchased a vintage 9x13 Vistalite tom for an audio project I am working on. In this post, I share what I learned in the purchase and restoration process. The Purchase. I found an inexpensive vintage 9x13 Vistalite tom in Translucent Smoke on Reverb. 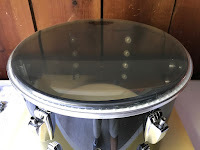 The listing described the drum's condition as "good" with some surface scratches but no cracks. It also noted that the Ludwig badge was missing but the drum was otherwise complete. Zooming in on the photos in the listing, I could see that the shell had multiple deep scratches and scuffs, but it seemed round and functional. The hardware showed moderate to severe corrosion. Since I needed an acrylic shell for audio rather than aesthetic purposes, I decided to go ahead and buy the drum. The History. After their 1972 introduction, Ludwig Vistalites grabbed the spotlight on the drum risers of John Bohnam, Robbie Bachmann, and Karen Carpenter. While the seller had no information about the history of my particular drum, we can tell from presence of a tone control that it is a vintage 1970s Vistalite. 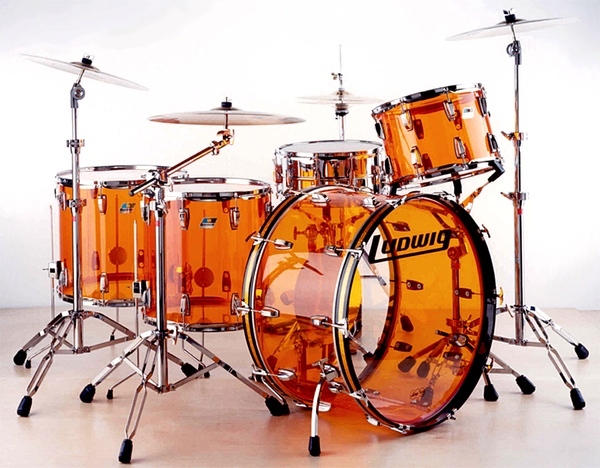 Translucent Smoke Vistalites first appeared in the 1977 Ludwig catalog. Since Ludwig discontinued the vintage Vistalites in 1979, we can deduce that this drum is between 38 and 40 years old. Ludwig reintroduced Vistalite drums in 2001, and the photo at right shows Ludwig's reissue of Bonham's classic Vistalite setup. Since the reintroduction, vintage 70s Vistalites have become collectable. 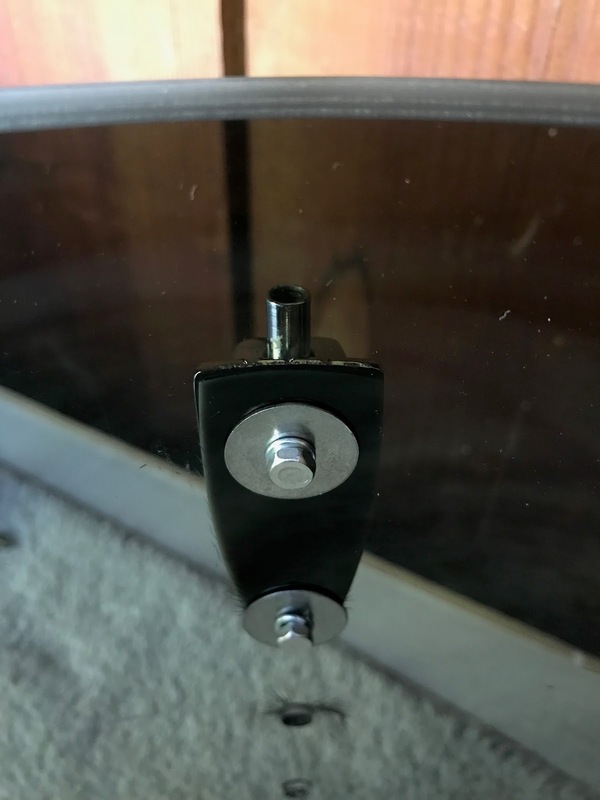 One Ludwig faction argues that vintage Vistalites sound better, while the other argues that the superior quality of reissued Vistalites' seams and bearing edges gives them, ahem, the edge. Initial Assessment. My "new" Vistalite tom arrived extremely dirty--the packing material consisted of foam peanuts, dirt, dead crickets, assorted beads, and at least one nail! As usual, I started with complete disassembly and thorough inspection of all parts. This drum shipped from Louisiana, and judging from the level of corrosion on all of the hardware, it lived much of its life in high humidity at best, and submerged in a bayou at worst. 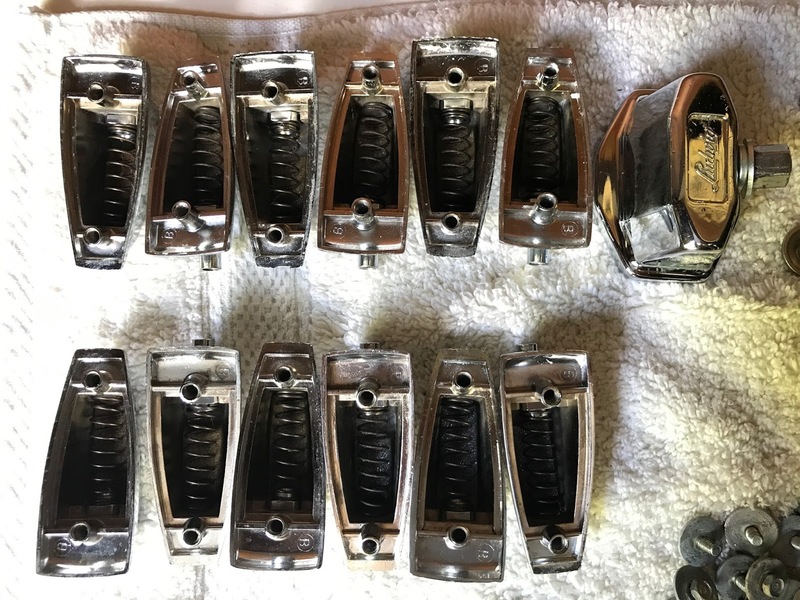 The hoops, tension rods, and tone control all showed quite a bit of rust, and the tension lug and tom bracket bolts were corroded as well. The shell had multiple deep scratches and scuffs. While the tension lugs themselves were in decent shape, with only a moderate level of dings and pitting, the springs were showing some rust. The drum shell, on the other hand, was totally unfazed by all the moisture. One of the advantages of synthetic shells is that they can handle all the moisture you throw at them without corroding, swelling, shrinking, or rotting. The Restoration. I decided to restore this drum into what I would actually consider to be good condition. 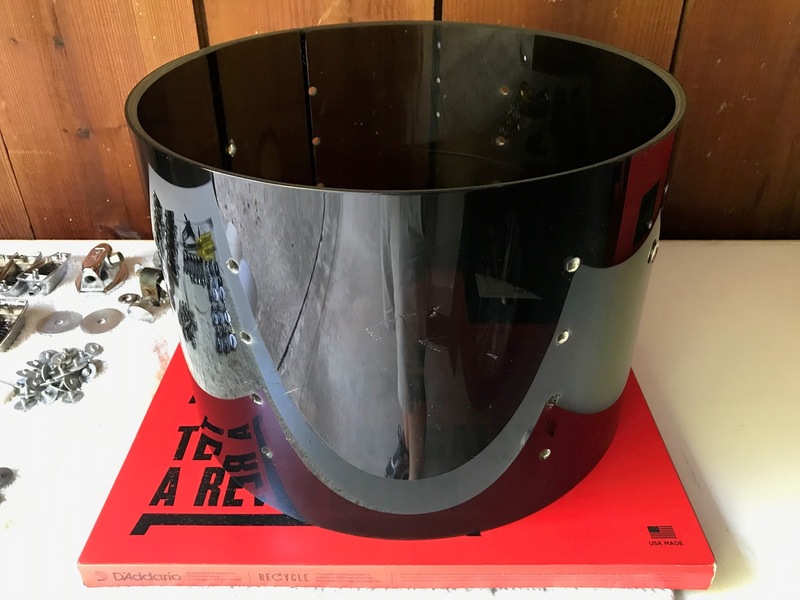 First, I ordered new 2.3mm triple-flange chrome hoops, 1-7/8" tension rods, and Evans Level 360 Genera heads from my friends at Drum Factory Direct. 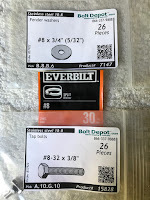 Next, I ordered new tap bolts and fender washers for the tension lugs and tom bracket from Bolt Depot, a great source for small quantities of specific types of bolts and washers. While I was waiting for the new parts to arrive, I decided to work on the tension lugs and the shell. Now that the tension lugs were off, I used a little Turtle Wax Chrome Polish & Rust Remover to shine up the lug casings. The polish will not fix pitting in chrome, but it did remove patches of oxidation and rust. I used the same product with a wire brush to remove the rust from the tension lug springs and receivers. One tension lug was missing the small foam strip that prevents the spring from rattling inside the lug. To replace it, I cut a piece of packing foam down to the size of the strip from another lug. Next, I used NOVUS' Plastic Polish Kit and a power buffer to attack the scratches and scuffs in the shell. The NOVUS kit includes three separate products to address deep scratches (#3), light scratches (#2), and cleaning (#1) of acrylic items. I used a power buffer with the #3 product on the deep scratches and scuffs. 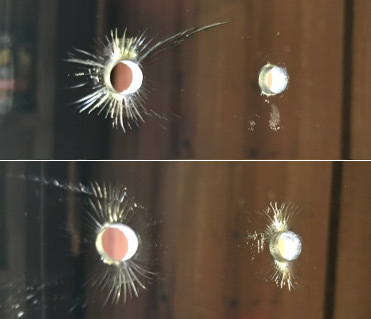 I saw significant improvement after about 20 minutes of buffing--the photos above and the one at right show the same side of the shell for comparison. If I had more time, I believe I could remove them completely. I then used the #2 product to buff out all of the light scratches. After buffing out the scratches and scuffs to my satisfaction, I wiped down the entire shell with NOVUS' #1 cleaner. While working on the shell, I noticed that it does in fact have cracks, contrary to what the seller stated. Several of the tension lug bolt holes are surrounded by star cracks. This is a common problem with Vistalites--over-tightening of tension lug bolts causes stress cracks to form and then radiate out from the bolt holes. There is not much that can be done about these cracks. The good news is that the tension lugs and bolt washers cover most of them, and I don't expect them to alter the tone of the shell. I also noticed small ridges in the bearing edges at each end of the shell seam. Vintage Vistalites are formed by rolling a sheet of acrylic into a cylinder and then gluing the edges of the sheet together, forming a seam. The ridges I noticed appear to be excess adhesive at the ends of the seam. Because this is a one-off project drum, I got out my Dremel tool and lightly sanded off the excess adhesive by hand, being extremely careful to leave the overall bearing edges level. 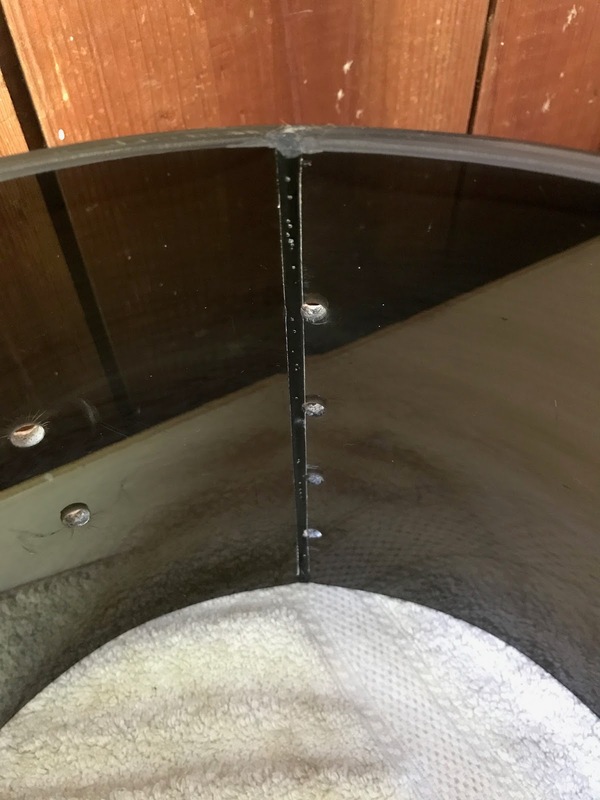 Because level bearing edges are so critical to drum tuning and tone, I always recommend that you leave bearing edge repairs to a professional, especially with wood drums. In the photo to the right, you can see the seam after I sanded off the excess adhesive. Note that the bearing edge is now completely level. The Re-assembly Process. After spending some time on the tension lugs and the shell, my new parts arrived. Let the re-assembly begin! tap bolt (hex head) in a 3/8" length, a #8 split lock washer, and a #8 fender washer with a 3/4" outside diameter. Note that I am adding a split washer and using a slightly oversized fender washer (the original had a 5/8" outside diameter). 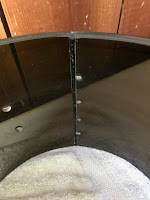 The oversized washer helps spread the stress of the bolts on the shell as well as cover more of the existing stress cracks, as you can see at right. To prevent damaging the shell and choking its tone, use the minimum torque necessary when bolting hardware to the shell. 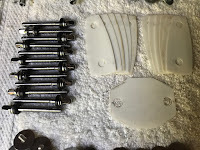 My process was to tighten the bolts evenly until I just reached the point where I was unable to jiggle the tension lug on the outside of the shell by hand (there is some play between the lugs and the bolt holes), then just a slight turn more. The split washers will help prevent the bolts from working loose over time. are installed on the bracket itself. Vistalite tom brackets also include mylar shims to keep the brackets from marring the shells. Slip the shim over the bracket bolt receivers, and then re-insert the bracket into the bolt holes on the shell. 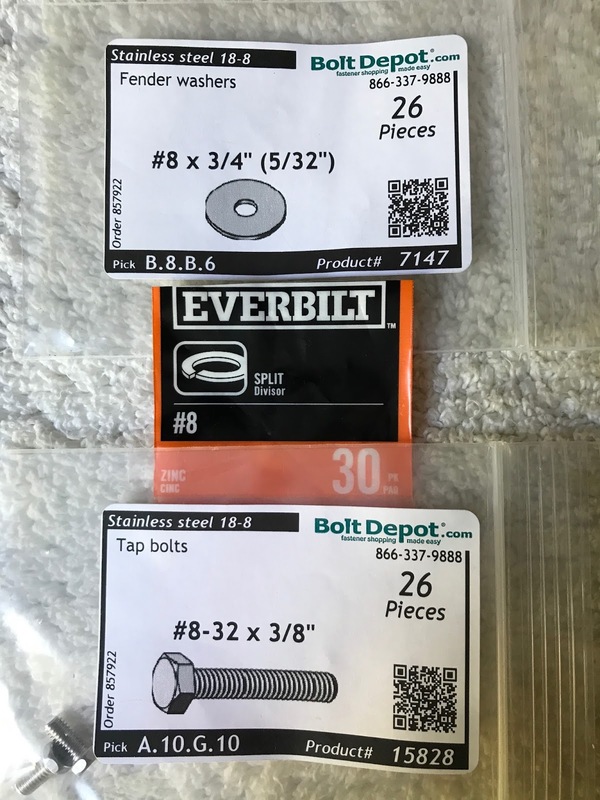 The tom bracket bolt and washer sandwich is a #10 tap bolt in a 1/2" length, a #10 split lock washer, and a #10 fender washer with a 1-1/2" outside diameter. 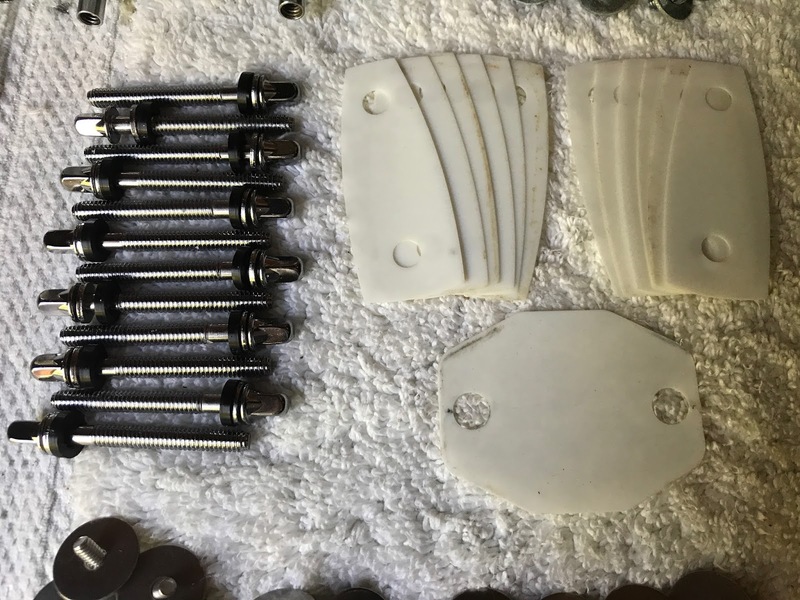 I cleaned and used the original fender washers because they were already formed to the shell. Step 3: Re-install the tone control. 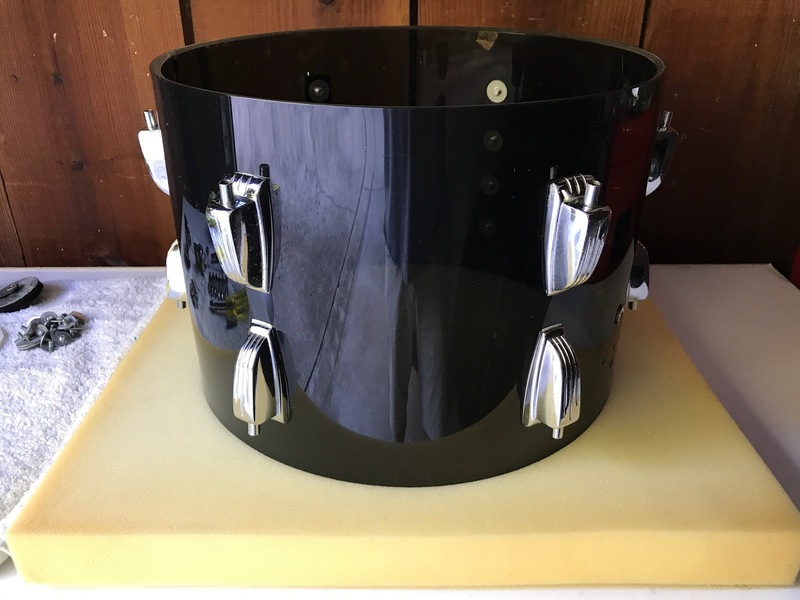 Skip this step if you are building a drum to be played--tone controls are outdated and there is no reason to add more parts that can develop rattles inside your drum. If you are restoring the drum to its original state, however, you will want to re-install the tone control. Insert the three small screws into the mounting holes above the vent hole. 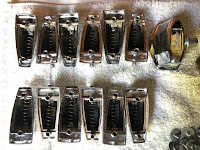 Thread them through the tone control bracket and the metal plate on the inside of the shell, add the washers and nuts, and tighten just enough to keep the tone control from jiggling. Step 4: Install the heads. New Evans Level 360 Genera heads fit perfectly on this drum. New chrome hoops not only look great but head off tuning problems arising from out-of-round hoops. At $11.50 a piece for new six-hole 2.3mm triple-flange hoops, Drum Factory Direct makes the decision a no-brainer. I installed nylon washers on the new tension rods and brought the heads up to an even tension before dialing in the tuning. Restored Vistalite tom looks and sounds good! Step 5: Tune the drum. Be sure to check out my post Tuning drums with Tune-bot for tips and tricks on drum tuning. A round and true drum with consistent bearing edges reduces the tuning effort, and the 6mm acrylic shell delivers more projection and brightness than a comparable wood shell. Step 6: Enjoy your new drum! As you can see, while not perfect, this 40-year-old cleans up well enough to be a solid addition to a vintage Vistalite kit.